Mahinur is distressed. 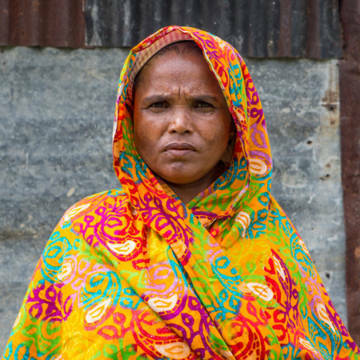 She is working her hardest to provide for her family in Bangladesh, but it is not always enough. When times are hard, we can feel abandoned and alone, as if nobody cares for us. Admitting that we cannot cope on our own can be difficult. We might feel ashamed, as if we are failing. All this makes it hard to ask for help. How much harder then, if when you do ask for help, the person you have turned to refuses you? As Catholics we believe in a world where everyone can flourish. Where no one is beyond the reach of the help they need. Because we are part of a global Church, which is present with people at a grassroots level, we have the potential to reach even the most out of the way communities. And our local experts work with them to make sure that they get the help they most need. Your support can help to make this happen, so that even more of those who call in distress do not feel abandoned. As Pope Francis says, it is possible for human beings to “feel compassion for others in such a way that all distance vanishes” (Gaudete et Exsultate #76). God my refuge, you save me when I call in distress. Lift the burdens of your people and work through us, so that all people may live a dignified life. Amen. Meet Mahinur in this video as she describes how it feels not to have enough to eat or drink. As you fast this Lent, keep her in your prayers and give generously to our Lent Appeal.